Nora is just not a compelling enough character to have that much narrative weight on her. "We will beat you" .................... after we keep skipping the chances we have had and you try and kill us again. I also found it ironic that Barry is explaining to Nora that messing with the time-line (or whatever) always causes residual damage, when Nora's very presence in our time causes damage every second she's here. Also, much as sitcoms of the '80s had plots they all had to do, -jury duty, cast locked in a confined space, a look-alike, -every SF show now has to do a Time Loop/"Groundhog Day" plot. Now we need an episode where Barry wakes up in an asylum and everyone is telling him that being the Flash is a delusion. Have they done that yet? Or was it another CW show. If they have I don’t remember it. Just off the top of my head it’s been done on Buffy and The Magicians, but there’s kore that I can’t think of right now. Exactly what I was thinking this entire episode. I realize this is the semi-annual "let our star Grant Gustin take a break" episode where he makes a token appearance, but this show is really going down the drain with its heavy focus on Nora. I like the character and they've just gone overboard with her entire arc. 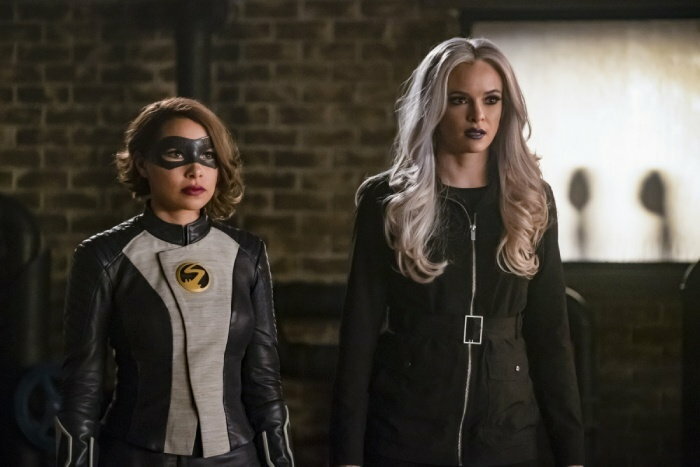 They've really defanged Killer Frost. She's basically a good guy now, which is not what I wanted. I seriously wish they would shelve the whole "Team Flash" concept for a few episodes. They've beaten the formula into the ground and it grows more tedious with each passing season. Cisco is likely gone from the show. While I would have been upset with this move back in season two or three, he's been less and less effective at the comedic relief role each season as the writers started giving him real character development. I saw that being reported, and it will be a real shame. I think cutting down the members of "team Flash" would probably be for the better, other rather nearly all the "Arrowverse" shows should cut down on the "team aspect" in many ways. So Cicada went to the same place every time, right? Couldn't she just show up there before he got there or something? Of course she also could have gone and gotten Cecille, and they all sit there quietly for the hour, but she's not very bright. If Nora knew everything that was going to happen why didn't they figure a way of capturing Cicada? Why does Cicada's costume look like a Mortal Kombat cast-off? Everything with Nora is awful, they’re writing her like she’s a 12 year old or mentally stunted. Cicada and Klein are maybe the worst people on a tv show in years. Because Street Fighter was already taken? They really need to stop dragging every villain out for the entire season. Who cares? We got to see her in the XS suit a lot. But they can't kill him because that would make too much sense. It's not like he's bulletproof. Watch XS flail her arms when she's supposedly "running" at superspeed. It's one of the goofiest things on tv at the moment. The close ups on her running at super speed is as dopey as anything Ive seen on a tv show.